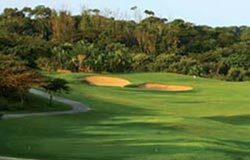 Play Zimbali Golf course in the morning and spend the rest of your day relaxing next to the pool or enjoying walks on the beach. 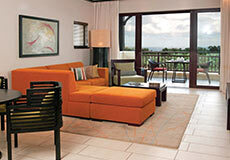 Theres plenty for children to do at Zimbali resort. Book a Twin Queen room and the kids stay free. Children under 5 eat free and children between 5 and 12 pay 50% of the adult rate. 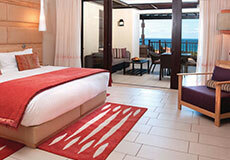 Fairmont Zimbali Resort is the newer of the 2 Fairmont hotels inside the exclusive Zimbali Coastal Estate. The estate is a 30 minute drive North of Durban just on the outskirts of the beachside holiday town of Ballito and a 15 minute drive from King Shaka International Airport. The resort’s exquisite natural beauty is dotted with pockets of urban flair and enhanced by the rich Zulu heritage of the KwaZulu-Natal province. 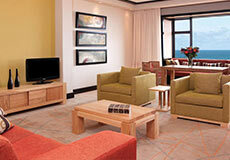 The Zimbali Resort Hotel has everything you would expect of a modern 5 star Resort facility including a choice of gourmet restaurants, plenty of sports activities, a kids club in the holidays, an exclusive Spa facility, a top rated Golf Course as well as a choice of luxury accommodation of course. 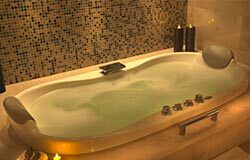 The Resort Hotel features 154 guest rooms and suites, including a Penthouse and Presidential suite and if you prefer a luxury Self catering Option with all the convenience of Hotel facilities then there are 18 Fairmont Heritage Place villas as well. Part cultural wonderland, the region boasts thousand-year-old battlefields and renowned eco-parks; part natural playground, it offers unique game-viewing and safari opportunities. And it’s yours to enjoy—in comfort and with world-renowned service—at Fairmont Zimbali Resort, an exclusive and elegant gateway to nature. Our 154 well-appointed Zimbali resort rooms offer scintillating views of the Indian Ocean, oversized verandas, and elegant decor of stone, wood and earth tones inspired by the area’s breathtaking natural surroundings. Our 280-square-meter (2,900-square-foot) ballroom, with a capacity for 180 guests for full sit-down banquets and 220 delegates in cinema format, offers ample space for any event. Some 150 square meters (1,615 square feet) of pre-function space allows for pre-registration and cocktail events, while an executive meeting room accommodates up to 12 people in boardroom format. We offer a convenient, full-service business center, complete with work stations, high-speed Internet, phone and fax lines and photocopying services. 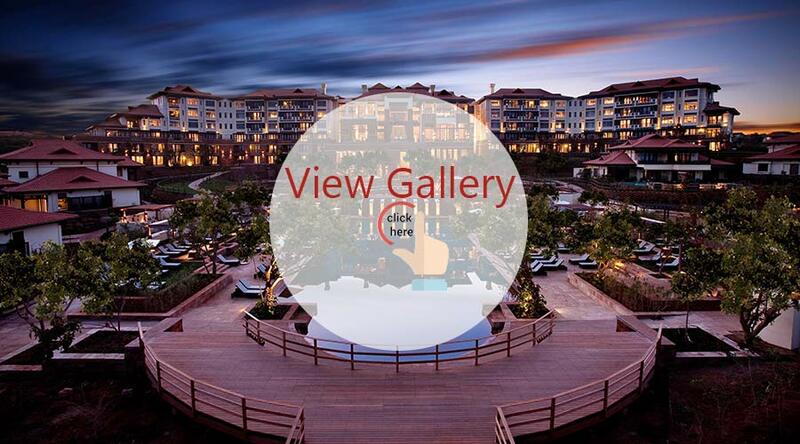 Fairmont Zimbali Resort’s range of appetizing dining options from light to full-course meals, local delicacies to ethnic-themed dishes will satisfy every palate. 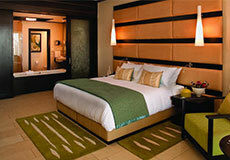 Offering an extensive breakfast and lunch buffet, followed by a global, à la carte bistro menu for dinner. Our lobby lounge offers specialty teas and coffees, including strong African roasts and Fairmont teas. Sip signature cocktails in the vibrant ambiance of our lobby bar. Grab a high-end coffee, or a deli sandwich or salad to go. Bask in the easy, poolside style of this unique burger bar. A sophisticated steakhouse atmosphere promises pure South African grain-fed beef, complemented by an extensive collection of South African wines. Vinum bar offers a wide selection of South African wines and an exciting selection of tapas-style bar food. This rustic, beach-club setting showcases a wood-fired pizza oven and barbecue cooking. 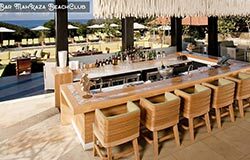 A beach-club bar with a cool, casual cocktail mood one that flows seamlessly into the evening. 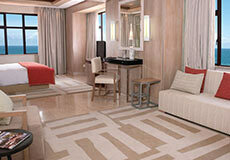 With African inspired décor the room features a walk-in wardrobe with digital safe. There is a work desk with internet, bathroom wrapped in part-frosted glass, sliding door with shower, bath and a private toilet. 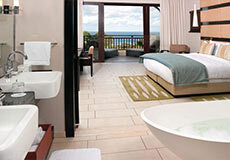 Features king-size beds and are enveloped with an array of scenery, including sea views, gardens and the main hotel pool. The rooms include a microwave, small basin and fridge. The Suite has an impressive full kitchen, partitioned from the dining areas by sliding doors, a lounge and dining area that leads onto a large patio with views of the ocean, gardens and the main hotel pool. The Seaview Suite features a breakfast bar with Nespresso Machine, a lounge and dining area that leads onto a large patio, the perfect setting for your morning coffee or tea with views of the Indian ocean, gardens and the main hotel pool. 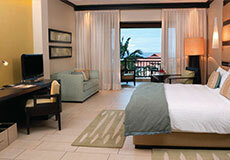 The Penthouse Suite is a distinctive tribute to grandeur, luxury and elegance. This authentic suite is a celebration of decadent leisure with breathtaking views of the Indian Ocean and prominent views of the hotel front. ALL RATES INCLUDE BREAKFAST FOR 2 PAYING ADULTS.Where children share a room the need to pay for breakfast seperately. Whether you’re planning an indulgent day at the spa, or popping in for a mini break, our special Spa Offers will leave you relaxed, energised and ready to take on the world. Ma Khaza is the quintessential beach bar with a casual cocktail mood that flows seamlessly into the early evening, complimented by flavourful meals from Ayoba! 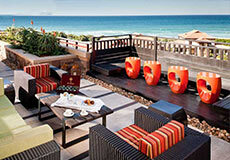 Sit back, take it easy and enjoy a cocktail while the cool Indian Ocean’s breeze sweeps over you.